The collar of a dress shirt is arguably its main centerpiece, as it’s not only the most visible part of a shirt when you’re wearing a jacket, but it can also enhance, or detract from, your face, and impact the overall impression you make. 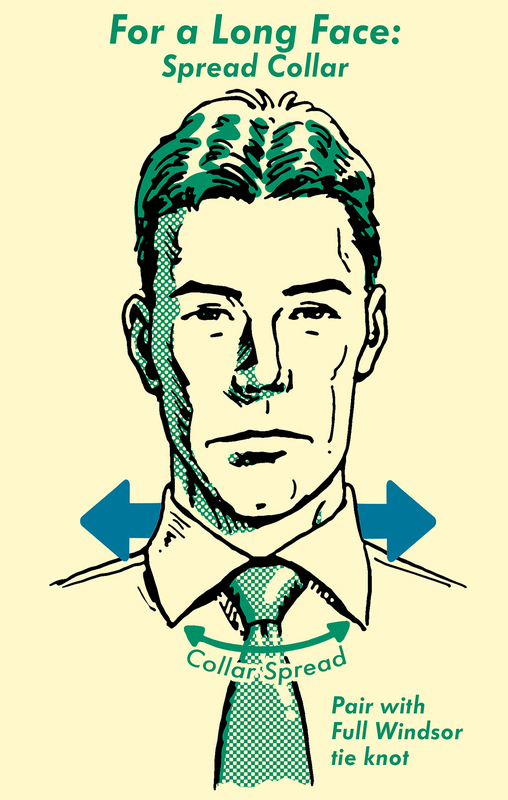 When properly chosen based on your individual facial structure, a shirt collar can balance and frame your face (and neck) to beneficial effect. Below you’ll find some tips on how to choose the best collar style for you, as well as how to pair it with the right height of collar band (the part of the collar that goes around your neck) and necktie knot. If you have a wide, round face, choose a narrow point collar. The point collar is well-suited for a man with a round face — one that’s wide, not overly tall, and has a softer jawline. You may have this face shape if you’re overweight, or just because of genetics. The spread of a point collar — the distance between the tips on each side of it — is small, and the collar tips point down vertically. This vertical orientation draws an observer’s eyes up and down, elongating and slimming the wearer’s wide, round face. Point collars come in different degrees of spread, and while one with a standard spread will have some of the intended effect, one with a narrow spread will really enhance it. Neck length considerations: If you have a short neck, choose a collar band that’s slightly shorter. Pair with tie knot: Four-in-Hand — this slim tie knot will fit the narrow point collar’s slender spread, and further counterbalance a wide face. 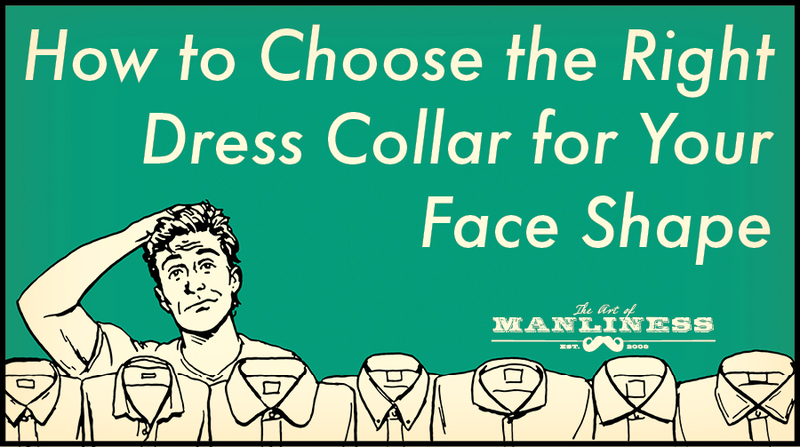 If you have a thin, long face, choose a spread collar. Befitting the name, the collar spread on a spread collar is wider than that of a point collar. The tips of each side of the collar point out to the sides; the degree of the distance between them varies, depending on whether it’s a semi/medium spread or a full spread collar. On the latter, the tips point out almost horizontally, and this orientation especially draws the viewer’s eyes side to side, balancing out a long, thin face. Neck length considerations: If it isn’t just your face that’s long, but your neck too, choose a slightly taller collar band. Pair with tie knot: Full Windsor – this large, broad knot will fill the ample space between the collar points and further counterbalance a thin face. 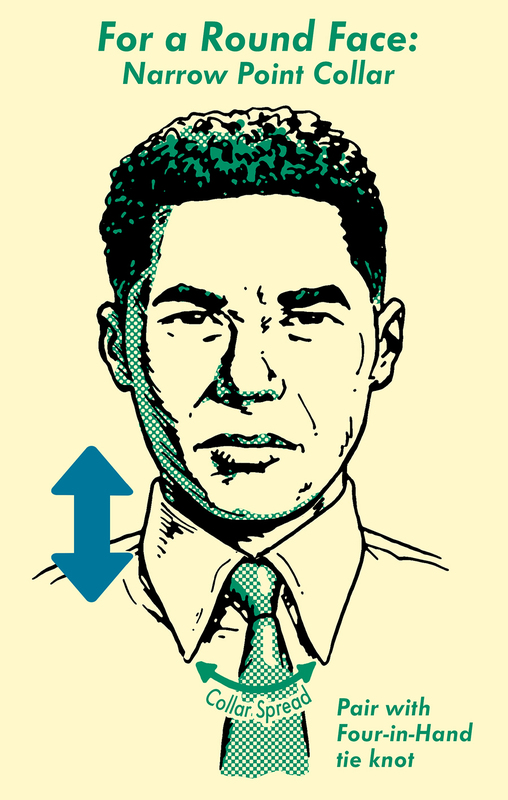 A spread collar on a man with a round face will only make his face seem wider; conversely, a point collar on a man with a long face will make his face look thinner. Choosing the right collar for your face shape will thus mitigate rather than exacerbate one’s facial peculiarities, enhancing the proportionality of its structure. If your face falls somewhere between wide/round and long/thin, then choose a semi-spread collar (which is really a close cousin of the standard point collar) and pair it with a Half-Windsor tie knot. You don’t have to take these suggestions as hard and fast rules, however. Their effect is of course subtle, and if you like a different collar type simply based on its style, you shouldn’t feel stymied in choosing it.